What Are the Benefits of Morning Walking? Morning walking has numerous benefits and can easily be integrated into your routine. 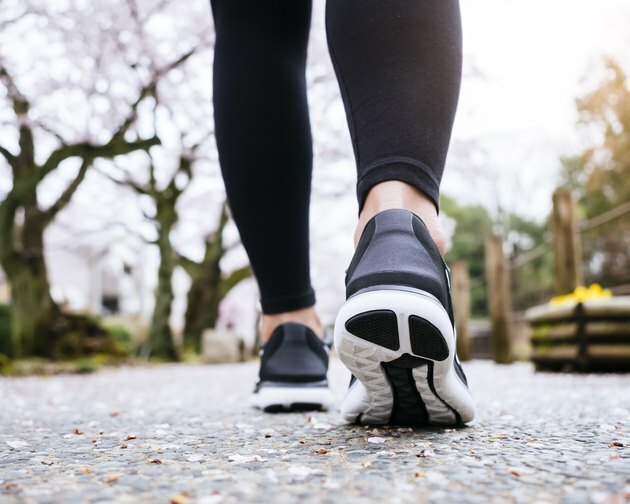 Morning walking requires no gym membership and no special equipment other than a good pair of walking shoes, and it can be done in your own neighborhood. Morning walking is especially beneficial for sedentary folks looking to ease their way back into an active lifestyle. Morning walking helps to burn fat. According to Jessica Matthews, M.S., a form of low intensity aerobic exercise such as walking burns 60 per cent of its calories from fat, compared to 35 per cent of calories burned from fat at higher intensity cardiovascular exercise. While it is true that higher intensity exercise burns more calories overall, morning walking burns enough calories that if you stick to it consistently, you will be able to lose excess fat. The metabolic syndrome is a constellation of risk factors that increase the possibility of developing cardiovascular disease. These include high blood pressure, glucose intolerance, low levels of HDL cholesterol, high levels of triglycerides, and insulin resistance. Andreas Katsiaras, Ph.D., states that even those who engage in as little as three hours a week of aerobic exercise such as walking are 50 percent less likely to be diagnosed with the metabolic syndrome that those who remain sedentary. Morning walking also has a psychological benefit. Christian Finn, M.S., likens morning walking to “a great way to set you up for the day.” A few minutes spent walking each morning helps you to center your thoughts, invigorates you and helps put you one step closer to making a healthy lifestyle a permanent change. Morning walking offers an opportunity to create a good feeling first thing in the morning and sustain that feeling throughout the day. Morning walking is an easy way to get started exercising. If you have been sedentary for a long time, if you are returning from a serious injury or recovering from a health condition, or if you are carrying a significant amount of excess weight, morning walking represents one of the easiest ways to begin to add exercise into your daily routine. Morning walking does not require anything besides a good pair of shoes and the desire to get healthy.